December 2, 2016, 9:45 AM · I have a deep respect for flutists because they possess the secret to making a sound that is a complete mystery to the rest of the world. Ask them to explain it and it takes a couple of sentences, the last one invariably being “blow into it like you would to get a whistle out of a pop bottle.” Now here’s where it gets complicated. The generic answer, the one size fits all, is not sufficient. It would take too long to explain what people do to mess it up. And while mere words would be inadequate, they would still be useful. With many students, however, the longer explanation is what the teacher creates to fix the particular problem. In music, the devil is not in the details. That’s where the solutions lie. Vibrato is essentially a self-taught maneuver. If your vibrato is full of bumps and robotic gestures, how do you simplify it? How do you replace karate-like jabs with coasting back and forth, gentle and rhythmic? Vibrato is one of the least understood violin techniques, much like making a sound on a flute. We are drawn to a particular vibrato by virtue of our individual make-up. When you’re ready to make a change, work with what you have, rather than throw the baby out with the bath water. This has several advantages. It eliminates the possibility of transferring the shaking and bumping from an arm vibrato to a wrist vibrato. It also begins the process in which reflective observation will make the necessary changes. Finally, refining what you have, instead of changing everything, will re-direct energy that is needed to think about the bow arm’s role in vibrato. I once worked with a student whose vibrato was on the verge of success, but it only had one missing ingredient. Vibrato success depends on just the right recipe, and all it takes is a certain tweak here or there. The problem is knowing where to give a little, and where to take a little. In his case, the student started the vibrato early, with too much intensity. Fortunately, his mind was such that by merely thinking about waiting a moment and being slightly less intense, he made the precise adjustment. Was he lucky? Or did he have the kind of talent that can re-wire the brain on the first try? Almost everyone has the ability to change the brain’s perspective to make it more amenable to music. Sometimes it takes several tries. Baby vibratos tend to have a cataclysmic effect on the violin. It reacts to the vibrato in similar ways as an earthquake, and causes several after-shocks. To fix the unwanted seizures, think about the details of your vibrato. If you’re confused as to whether it is of the arm or a wrist (hand) variety, decide once and for all. It’s the ambiguity which causes the problems of bumps and collisions. All it takes is one motion to make a great vibrato, and a sense of exactly when the motion begins. Don’t give mixed messages to the arm. Know the exact direction of the vibrato. It’s counter-intuitive. It’s an oblique angle to the violin, not parallel to the fingerboard. Apparently there is a malady known as carpophobia, which may afflict a fair number of violinists. Sometimes a hard wrist is the likely culprit blamed for a skewed vibrato. If both wrists are hard as a rock, I can imagine a violinist developing an obsession, and fear, of wrists. However, when you look up carpophobia on the Internet, violinists don’t come up. (If you teased your sister that her wrists would fall off if she kept rubber bands on them, you probably created a carpophobic. Look it up on the Internet.) Maybe in the vast literature of musicians’ ailments, someone has mentioned its connection to violinists, in the same chapter as fiddler’s neck. When I realized that both of my wrists were too tense, I imagined they were light as marshmallows. That helped a great deal. However, since I was dealing with years of playing with hard wrists, nothing can completely eradicate the problem. Nevertheless, some pressure is necessary. It’s part of my make-up, my sound, and my technique. Who knows, some of it is perfectly fine. Accepting your particular way of doing things is essential to freeing up the musical mind. That being said, apply pressure to the neck judiciously. 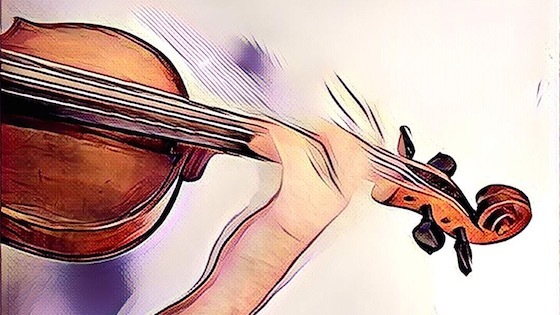 Let your “holding the violin” technique include a pulling away from the neck to equalize the amount you’re pressing into the neck. The pressure you’ve been applying to the neck for years is primordial and human. It’s not the cause of the violin shaking unevenly. Imagine water traveling through a straw. The motion of the hand as it moves up and down and around the neck allows the same freedom and flow that water experiences. Another impediment may be the sudden surge of a beat, or rather, the ictus of the beat. Ictus is the most sudden manifestation of the pulse-the jab or the point of the beat. (Solti wore his ictus like a badge of honor; Boulez hid his.) A good vibrato avoids icti like the plague. The part of the beat that nourishes the vibrato is the pendulum component, the round-like quality that allows pulses to inhabit their full value. If the beat asserts itself too much, and makes the vibrato restart with a visible seizure, its roundness and coasting quality will be sacrificed. December 3, 2016 at 06:29 PM · "Work with what you have..." Thank you! It is so discouraging to think you must start completely over if you're not happy with your vibrato. I will follow the steps you outlined. You mentioned both wrist and arm vibratos. Is one preferable to the other? Do some violinists employ both at different times, depending on the sound being sought after? December 3, 2016 at 06:49 PM · Violinists do use different ones at different times, and it's ideal to learn both of them. Here is a story with some specific exercises, and also see the others linked at the end of Paul's blog. December 3, 2016 at 11:53 PM · If you have a relaxed bowing arm, wrist and hand, your left arm, wrist and hand will tend to loosen up in sympathy. Also, if you get the opportunity, play in an orchestra alongside players with good vibratos. Over time there may be an osmosis effect (you're subconsciously trying to copy them). the other hand, it takes more delicate motor skills to start learning a wrist vibrato. Another benefit of the arm vibrato is that it can easily evolve into a wrist vibrato. All you need to do is keep the energy flowing from the arm, but limit its movement. The wrist will keep the movement going when the arm is almost still. December 4, 2016 at 03:07 AM · So the way to practice arm vibrato is to channel your inner Heifetz as you're giving a lot of people the finger (e.g., whilst driving)? Okay, just kidding. 3 years I did a vibrato reboot. I'm glad I did, even though it was kind of exasperating. December 4, 2016 at 07:26 AM · Paul, what did your vibrato reboot involve? December 4, 2016 at 02:29 PM · Another complexity that occurs when you're learning/refining vibrato is the difficulty of actually hearing the vibrato. You may not even notice it while you're playing, but hear it when you listen to yourself on a recording. With all that you're dealing with while playing, a tiny oscillation can easily go by unnoticed. The technique of hearing yourself was discussed by Henryk Szeryng, who didn't like the process of listening to himself on a recording. Sometimes you'll hear a musician say he can't hear himself. That's when the "inner ear" (otherwise known as the mind) has to really assess what sound is coming out. So if you're listening well, and you hear the vibrato is working but the sound is not right, the problem is often that the bow is not providing a beautiful blanket of sound for the vibrato to mix with. Once you figure out that's the problem, it's not a big deal to move the bow with more sweep and lightness. December 5, 2016 at 02:18 PM · Laurie, my vibrato was in the category of "sound and fury signifying nothing" which means that I was shaking around a lot but didn't really get any depth (width?) in my vibrato. Still working toward that, but my reboot (back to Sassmannshaus-type exercise, etc.) taught me to know at least what I'm looking for -- for the finger to roll back onto the pad -- obliquely, as Paul Stein points out -- and NOT forward onto the fingernail (really!) -- and thereby develop not only variation in pitch in the correct direction but also color. I didn't understand the muscles and motions needed to achieve that. Still not claiming great vibrato but I'm much better off now. My vibrato originally (like much of my violin technique) was taught by demonstration. My childhood teacher did not explain how to do things. He showed me on his violin -- yes, in detail and very closely -- but it's not the same thing. For some things that's a very very good way to learn, and I think there are a lot of teachers who need to teach more with *their* violins. But for some stuff like vibrato (and intonation) teaching by demonstration alone doesn't really work. My intonation needed a reboot too. I had no idea, despite 11-12 years of childhood lessons, that I should be listening for the internal resonances of the violin. A good counter-example is upbow staccato. Someone can tell you how to do it 1000 times but if you watch someone do it -- very closely, like inches away from their hands -- you will instantly know exactly what to do. That's why Todd Ehle's videos are good -- he gets the camera very close for stuff like that. December 5, 2016 at 11:24 PM · It's funny how sometimes a demonstration works, or sometimes a description. As long as *something* works, that's what matters! December 6, 2016 at 12:40 AM · To Paul Deck, in the "small world" category, I couldn't help but mention that Todd Ehle's father was one of my college theory and counterpoint professors! I had the utmost respect for him. December 6, 2016 at 08:34 PM · It took me six years before I could get any decent sort of vibrato at all. It turns out that I was gripping the neck against the side of my index finger. This gave security, but locked my hand in place and made vibrato almost impossible. I'm getting better now, but I'm still looking for the perfect balance between supporting the violin and keeping it stable while giving my hand the freedom to vibrate. December 7, 2016 at 05:08 AM · Charlie, I have certainly felt the discomfort of my hand not supporting the violin, especially when vibrating. Here's a technique that helped me: the idea of my left hand forming around an "air pocket". The air that my hand envelops fits my hand perfectly. They sure fit together better than the side of my thumb and part of my palm touching the violin's neck. Last year I stopped using a shoulder pad, one that I had used for 25 years. Of course my violin shook even more, but I made up for it by intensifying my concentration. My bow arm got stronger because I wanted it to. The more I concentrated, the less I cared that the violin shook.